Ever wondered why doctors and nutrition-people (like me!) keep talking about how important it is to ‘eat a rainbow’? 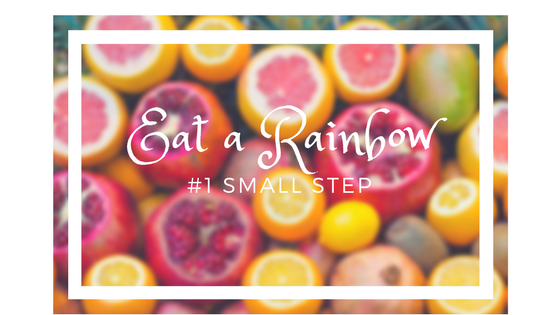 (A phrase which is dangerously close to the slogan for Skittles – ‘taste a rainbow’- which will have quite the opposite effect on your health!). It’s because brightly coloured fruits and vegetables contain an array of natural compounds with anti-inflammatory and antioxidant effects that are all bound up with what colour they are. So for example, orange and yellow veggies like peppers, carrots, and butternut squash are rich in beta-carotene, an immune-bosting antioxidant compound that’s a member of the carotenoid family, whilst dark bluberries and red grapes contain cyanidin – another protective antioxidant compound. Including at least 1 food from each colour group everyday means you will be nourishing yourself with a vast range of naturally powerful ingredients, giving your body the support it needs to cope with modern life! Green powders are helpful if you struggle to get enough greens into your day: mix spirulina, chlorella, barley grass or wheatgrass powder into pesto to boost the antioxidant and protein levels. To support blood sugar stability and reduce reliance on refined carbohydrates, swap to higher protein alternatives. Mung bean pasta, lentil pasta, quinoa, or wild rice are good alternatives. If you’re dealing with intestinal yeast overgrowth (and this is best confirmed with a stool test rather than trying to guess), think foods before supplements: natural anti-microbials such as garlic, ginger, oregano and marjoram can be added easily to salads, soups, casseroles – even herbal infusions. The anti-inflammatory actions of turmeric and cinnamon are well documented; these spices blend well with warmed almond milk to make a simple chai-style beverage. Seaweed flakes can be sprinkled into salads, soups or casseroles, and Nori sheets make a good alternative to wheat wraps, instantly increasing the iodine, zinc and magnesium content of your meal – perfect for thyroid support. Mixing a tablespoon of olive oil into 25g of butter creates a spreadable butter rich in oleic acid – with none of the negative effects associated with margarine or poorly processed vegetable oils. Encourage children to explore different coloured vegetables by using a picture colour chart and negotiating which coloured veggies to try next. Nourish your friendly gut bacteria with pre- and probiotic food. Add a tablespoon of sauerkraut to grilled salmon and roasted vegetables; use unfiltered apple cider vinegar in salad dressings with lemon juice and fresh herbs; or mix kefir into a morning smoothie. Green vegetables can be problematic for many people, especially supertasters. A basic smoothie made from baby spinach, banana and almond milk is a gentle option to begin with, and is packed with folate, vitamin K, vitamin C, and the antioxidant compound lutein. If you’re managing IBS, add fennel or caraway seeds when steaming brassica greens as this helps to soften the taste and aid digestion, reducing bloating and wind. To eat different foods you have to buy different foods. A vegetable or fruit box delivery scheme is a hassle-free way to have new ingredients delivered direct to your door. Many schemes offer inspiring recipe ideas too. Remember, the idea behind #1 Small Step is to encourage steady change and growth whilst side-stepping overwhelm. So pick 1 new idea to try, and build up those changes gradually!